2 Would These Natural Rosacea Remedies Help You? 5.1.1 How to Take Care Of Rosacea? 5.1.2 How to Treat Rosacea? 10 Effective DIY Recipes That Make At-Home Rosacea Care Super Simple! Rosacea is most common in white women from the age of thirty to fifty. Rosacea in men tends to be more severe and is usually accompanied by rhinophyma or an enlarged, chronically red nose. People with fair skin and who flush easily are more prone to develop rosacea. Rarely does it affect other parts of the body and it’s not a dangerous condition but can become embarrassing for cosmetic reasons. Also, without the proper care, it could become a disfiguring condition. There are some very important nutrients that help with the treatment of rosacea. Primrose oil contains linoleic acid and can be applied 3 times a day. Pycnogenol is a powerful antioxidant and helps reduce histamine production. Vitamin B complexes are anti-stress vitamins and have shown to be useful in the treatment of rosacea. Some other nutrients that are beneficial are Kelp for good skin tone, multivitamin and mineral complex for deficiencies and Zinc which enhances immune response and helps repair skin tissue. Herbal remedies for rosacea can be a natural way to control the condition. A good source of chlorophyll is alfalfa. It helps to detoxify the body and provides many needed vitamins and minerals. Aloe Vera has excellent healing properties for the skin and can be applied topically to treat dry skin. For skin tone, try borage seed, dandelion root, dong quai, parsley, sarsaparilla and yellow dock. Burdock and red clover are powerful blood cleansers. To nourish the skin and promote quick healing try calendula, cayenne, fennel seed, ginger, marshmallow root and slippery elm bark. Milk thistle helps the liver cleanse the blood and nettle and rosemary help with the skin tone, nourishment and healing. Some other recommendations include, of course, the diet. Go heavy on the raw veggies and grains. Avoid saturated fats and all animal products. This list includes alcohol, caffeine, chocolate, cocoa, cheese, dairy products, sugar and spicy foods. Try keeping a food diary to narrow down the possibility of a food allergy. One simple test is to sit down, totally relaxed, and takes your pulse rate (adults 60-100 beats per minute). Consume the food under suspect, wait about twenty minutes and take your pulse again. If the rate increases more than 10 beats, eliminate that food from your diet for one month and check yourself again. Always use the purest form of the food you are testing so you won’t get other ingredients in the mix. Other things to avoid are extremes of temperature, makeup or cosmetics (or make sure they are all natural, water based products), topical steroid creams and wearing tight clothing. There is no known cure but, again, it is not a dangerous condition. Prescription creams and oral antibiotics can help keep the inflammation under control. These prescribed drugs can have side effects so be sure to consult your physician if you are experiencing any symptoms. Vascular disorders may be involved in causing rosacea based on clinical studies. Structural abnormalities in the small blood vessels in the facial skin are common in people with rosacea. People that take drugs for dilating the blood vessels exacerbate the condition and people with rosacea tend to have migraine headaches that are linked to vascular malfunction. Would These Natural Rosacea Remedies Help You? Rosacea is a condition that affects thousands of people around the world, but many who suffer from it don’t even know they have it. Rosacea is a skin condition that affects the face, which gives the false appearance, that the person who is suffering from it is blushing deeply at all times. They look flushed and uncomfortable and the condition can be embarrassing. In some cases of Rosacea, swelling and pimples can be common, as well. While doctors aren’t sure what causes Rosacea, it is thought that a lack of hydrochloric acid in the stomach may be relevant. Some doctors link Rosacea to food allergies or microscopic parasites and it is impacted by environmental factors like the weather or heat. It is three times more likely in women than in men. Treating Rosacea naturally is a good place to start when looking for ways to reduce symptoms. The first thing is to try to figure out if you have any food allergies. Remember, just because you haven’t been allergic to something in the past does not mean that you won’t ever be. Rosacea is most common in people aged 30-50, and often food allergies can show up during that same age group. Once you have determined whether you’re eating any foods that you might have an allergy to, the next step is eliminating those foods from your diet. Sometimes this can be harder than it sounds. Yeast allergies seems to be the most common food allergy associated with Rosacea. If yeast isn’t causing you problems, try to eliminate foods from your diet that are known to dilate blood vessels, such as spicy food, alcohol or caffeine. Some Rosacea sufferers have found that their most serious outbreaks often coincide with bouts of indigestion. This correlation is usually found when eating fatty foods. A basic digestive enzyme pill taken before eating has shown major improvements for Rosacea sufferers. The next step if those things don’t work is to find out if you have a lack of hydrochloric acid in your stomach. Your doctor can prescribe natural hydrochloric acid tablets that you dissolve under your tongue that can help clear up Rosacea. Some sufferers of Rosacea have found that some skin creams high in aloe or lanolin work to clear up most of the signs of Rosacea. Also sufferers of Rosacea have noticed improvements after taking vitamin b-12 supplements. You can find vitamin B-12 at any grocery store or health food store. The vitamin B-12 link to Rosacea is actually linked through tiny mites that live on the skin, but tend to live in larger numbers on the skin of those that suffer from Rosacea. The mites block pours and cause an increase in bacteria on the surface of the skin that is thought to lead to Rosacea. An increase in vitamin B helps keep these mites at their normal level, therefore controlling Rosacea. Because Rosacea is so misunderstood by modern science, finding a consensus for a cure can be almost impossible. The best thing to do to find the treatment that works for you is to talk to a doctor who is well-versed in treating Rosacea and also speak with other Rosacea sufferers to find out what works for them. It may be a case of trial and error. According to the Mayo Clinic, rosacea is a chronic inflammatory skin disease that commonly affects adult women more than men. If an individual is suffering from this condition, she will have redness in the face and small but red pus filled bumps called pustules. Once the condition is not treated, it will get worst. Although this skin condition is not curable, symptoms can be treated with a doctor’s prescription of topical medications, oral antibiotics or surgery. There are also some natural remedies that can help the condition. The heat of the sun can trigger rosacea flare ups, so one must use a sunscreen protection factor of at least 15 or higher every time she needs to go out under the sun. Winter can trigger rosacea too so you should protect your face with a scarf or ski mask. Wind is another factor that can worsen the condition. You must avoid rubbing or touching your skin too harsh as this can irritate your affected skin. Proper care of the skin can help prevent rosacea flare ups. The Mayo Clinic suggests washing the face using a gentle cleanser like Dove or Cetaphil. Do not use products that contain alcohol or too harsh ingredients that can irritate the skin. According to the National Rosacea Society, spread facial cleanser with the use of your finger Alternatives or by using soft pad or a wash cloth. When using topical medication for rosacea, you should apply moisturizer after the medication has dried. Regarding the use of make ups, the Mayo Clinic said that you must used products that are noncomedogenic and in order to cover the redness, use yellow or green tint make up. Dietary changes can also lessen rosacea flare ups as stated by Dr. Oz Show website. Spicy foods, hot beverages, alcohol must be avoided as they trigger both flushing and redness. In addition to this, the National Rosacea Society noted that are cases of rosacea flare ups after consumption of some fruits and vegetables, marinated meats and dairy products. It is necessary to keep a record of what you eat to trace what food triggers your rosacea symptoms. Stress based on the survey of the National Rosacea Society is one of the leading triggers of rosacea so controlling your stress is at the same time preventing rosacea flare ups. Exercise can be a trigger too so, do your work outs in the morning or evening when temperature is cooler. The advice is do your exercises more often but in a shorter period of time and have cooling fan running on your indoors and try to have cold water on hand to sip or ice chips every time you workout. For the other well known alternative remedies for rosacea, there is no scientific evidence regarding their effectiveness. Treatments like colloidal silver, emu oil, oregano oil, vitamin K and laurel wood have no conclusive evidence. With the influx of so many commercial products for the rosacea treatment in the market today, many individuals still choose home remedies for rosacea instead of the commercial rosacea skin care products because these products may cause adverse side effects because of their chemical contents. Rosacea is skin condition is very hard to manage especially in advance stages. It has always been a challenge for these patients to find effective natural rosacea treatment. The skin of these patients is too sensitive and one wrong pick of rosacea treatment would lead to aggravating this condition. Thus, it is imperative for patients to take extra caution in consuming natural rosacea treatment. Therefore, it is important that these home remedies for rosacea have undergone clinical studies and trials before you consider using them. One of the most widely used natural products for rosacea is Chrysanthellum indicum, or more commonly known as golden chamomile. There are creams in the market that contain extracts of this natural herb. It is noted from a large study that people treated with 1% of Chrysanthellum indicum have shown improved symptoms. This extract reduces the inflammation of the skin and keeps the skin moisturized. In one small study, green tea cream has shown therapeutic effects to those who have rosacea. Green tea contains polyphenone, an active ingredient responsible for repairing and rejuvenating damaged skin, resulting for significant reduction of pustules and red bumps in the skin. It nourishes and keeps the skin moisturized during its process of repair. Rosacea is a very common skin disease that causes redness on your cheeks, nose, chin and forehead. Sometimes, little bumps and pimples appear on the red parts of the face. Rosacea sometimes also causes burning and soreness in the eyes. Causes of Rosacea are unknown but experts say that something always triggers the symptoms. Bacteria don’t seem to cause infection but it aggravates symptoms of rosacea. Some of the cases prove that it seems to run in families. It was a myth that rosacea is caused by alcohol abuse which has proven wrong but in people who have rosacea, drinking alcohol causes flare and symptoms get worse. Things that cause flare-ups are called triggers. Common triggers are exercise, sun, hot weather, stress, spicy food, alcohol and hot baths. Swings in temperature from hot to cold or cold to hot can also cause flare-up of this skin problem. How to Take Care Of Rosacea? 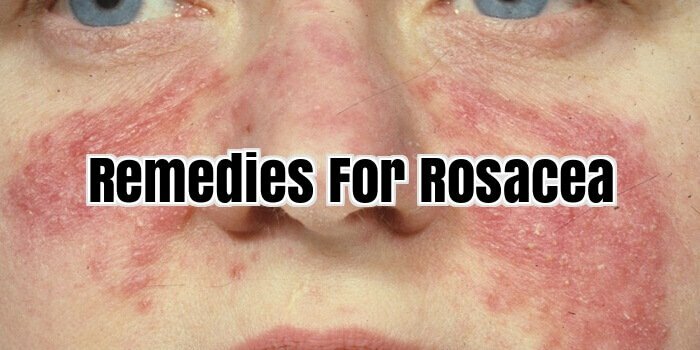 There are many things that can reduce symptoms and keep rosacea from getting worse e.g. getting symptoms under control with prescribed medicines by doctors. Dermatologists can refer to different treatments and medicinal ointments and drugs to reduce breakouts and ease irritation or redness on the skin. Early and quick treatments to breakouts will help reduce any future breakouts. In the long run, keeping a watch on your breakouts and studying the pattern will help you to cure and keep rosacea at bay. Keeping a diary of what you eat and drink can help to find the triggers. Keeping yourself away from sun can also help to reduce breakouts. Use sunscreens and moisturizers to make your skin more resilient and safe. Skin care products should be very gentle and specially designed for sensitive skin. Special care should be taken of eyes. Eyelids should be washed gently and eyes should be kept moist either by artificial tears or wet cloth. a) Pills or low dose antibiotic to treat redness and breakouts. d) Artificial tears or prescribed eye drops for dry, red and irritated eyes. e) Cosmetic surgery to treat thickened or bumpy skin on the nose and face. In this world, only two things can give you rosy cheeks: A good quality Blush-on or Rosacea. Now, the only difference is for the first one we like to pay whereas the latter, totally comes on its own. Rosacea or commonly referred to as, Red Cheeks is approximately affecting more than 16 Million people in US. The skin condition features rosy cheeks, facial flushing, blushing, redness, burning, red bumps, and small cysts. If you’re suffering with one of Rosacea symptoms, then don’t panic. There are a lot of natural, easily accessible and affordable treatments you can use to help yourself with that town drunken look. Following are the top, most effective natural Rosacea treatment hand-picked by women around the world. 1. Be Smart, Avoid the triggers! You probably would’ve been expecting a magic ingredient at the top of the list. But as it shows, according to Rosacea suffering victims, when rosy cheeks and visible veins become a real pain, the first think anyone needs to do is to cut off the triggers. This is called shutting the faucet first and then controls damage later! If possible avoid, Medications like topical steroids and/or opiate painkillers. There are many effective topical ointments available over the counter that uses natural ingredients to help fight rosacea. No matter what others say, these OTC treatments have proved very effective in the past few years as these provide instant relief. Many women like to carry them in their purses as anytime-anywhere rosacea treatment. Our favourite OTC is Rosacea treatment by Revitol. Pure Aloe Vera gel is like a miracle in a jar. It’s easily available. After washing your face with lukewarm water, apply Aloe Vera on the infected areas. You’ll see redness becoming less visible. Aloe Vera has the strength of a steroid cream but works without side effects. For best results use this with a gentle soap like Dove or Cetaphil. If you don’t know about Chamomile yet, probably you need to revise your rosacea knowledge. This is probably the first trade secret to be passed on from a rosacea mother to a rosacea daughter. Using Lavender and Licorice can go both ways. If not allergic, they can act as great anti-inflammatory and anti-bacterial but, if somehow an allergic reaction shows, trust us you wouldn’t want to hear these two names ever again. So, with the double Ls do a little patch test first. If after initial application nothing happens, use Lavender oil or licorice gel. These can be very reliable against Rosacea. According to a Saeed et.al study, Lavender is even effective against dermatitis. It soothes the skin and makes visible lesions and scarring go away. These two probably work the best together. Oatmeal and honey mixture cleanses, moisturizes, soothes and cools the irritated skin. They’re powerful anti-inflammatory. To get fast results cook oatmeal with Chamomile and let it cool. Now pour honey and apply it on your skin twice daily. Within 2 weeks you‘ll notice reduced redness and lesions. For rosacea not every solution needs to be topical. You have to eat healthy to be healthy. So, during an epic rosacea episode, eat diet rich in Omega-3. This includes eating a lot of salmons, sardines and halibut. Also eat a lot of berries and fruits because the bioflavonoids present in these prevent artery dilution, a leading cause of rosacea. Lastly, don’t forget your Vitamins from leafy greens and whole grains and almonds. These were some of the most effective natural rosacea treatments in book. You can use them with an all-natural ointment Revitol Rosacea for quick results. Nowadays, more and more people are neglecting appropriate skin care because of hectic schedule and this lead to skin problems such as preventing Rosacea. Rosacea’s causes are yet to be identified until now. Due to its generality especially in women, rosacea is regarded as one of the most typical skin conditions in America with 1 among 20 Americans experiencing it. Generally, known by flushing of the skin and the manifestation of reddish or purplish discoloration on the skin, Rosacea has come to be an issue particularly among females. In fact, researches show that an increasing number of females start to be less confident as a result of the permanent extensions of small blood vessels on their skin which also result to red and swollen nose. Because of its infrequent nature, Rosacea became one of the skin disorders that are hard to manage. However, experts say that prevention is the most effective treatment to any disorder which is why people who might be prone to this skin condition should develop good skin care habits as soon as possible. Experts say that eating healthy foods is one of the main keys in fighting skin condition like Rosacea which might be triggered by toxicity that modern lifestyle brings. Nowadays, with the increasing numbers of individuals that suffer from various skin disorders, we must be more vigilant in keeping up with a healthy lifestyle by consuming nutritious foods. This is vital not only to ensure good skin but also to maintain overall well being. Time and again, nutrition specialists say that there are 2 significant points that bring about good skin—these include eating the appropriate amount of food based on the person’s need and lifestyle and consuming a variety of foods to make sure that the individual will get balanced diet. And because food and eating properly contribute so much to a healthy diet, people ought to focus more on considering the food their body requires especially on a diet. Professionals point out that diet food ought to have the essential minerals and vitamins that are quite essential for weight management and metabolic rate. These diet foods ought to include Vitamins B2, B3, B5, B6, Vitamin C, choline, inositol, chromium, manganese, and zinc. Studies reveal that the best foods that help people in achieving a healthy skin should include a wide array of fruits. Aside from being an all-natural product, fresh fruits are low in calories, rich in dietary fibre that helps boosts satiety, and satisfies a person’s sweet tooth without worrying about putting on weight. Made up of all the nutrients and vitamins it has, fruits are an ideal diet food for those who are into losing weight or weight reduction and those who are striving to maintain their weight. Other nutritional advantages of fruit include the prevention of vitamin insufficiency, a rich source of dietary fibre and rich in foliate. The same as fruits, vegetables are also regarded as perfect foods to avoid Rosacea and to those who are having problems in maintaining good skin care routine. Aside from being a rich source of essential minerals and vitamins like vitamin B-complex micronutrients, vitamins C, E and K that overcome vitamin insufficiency, vegetables are also great sources of the protective plant micronutrient called “phytochemicals,” help in preventing rosacea. Blushing is often a sign of embarrassment or shyness. However, facial flushing that persists is often a sign of a medical problem. A common cause of persistent redness in the face is a skin disorder called rosacea. In addition to making sufferers look as though they are flushed all the time, this skin disease is sometimes accompanied by pimples and small visible veins. Left untreated, this condition worsens over time and can even affect the eyes and nose. While there is no cure for rosacea, there are plenty of pharmaceutical remedies on the market designed to treat the symptoms of the disease. However, not everyone is able to use these medications and sometimes the side effects associated with them significantly outweigh the benefits. An alternative option is to use a natural treatment like essential oils for rosacea. Here are some oils you can use to help alleviate the symptoms of rosacea and promote faster healing of the skin condition. Before using any of the oils or products listed, you should first test it on a small patch of skin to determine if you’ll have any adverse reactions to the substance. While most people are able to use natural oils with no problems, a minor few are not so fortunate. It is better to be safe than sorry. Revitol Rosacea Cream – Although not an oil, this is arguably the best home remedy for rosacea, or at least one of them. Formulated with a combination of potent herbs and oils, this cream works fast to eliminate the redness, itching, swelling, and acne associated with the skin disease. Users reported seeing results within 7 days of starting a daily regimen that included Revitol Rosacea Cream. This is a moisturizing product made from a blend of several different oils. The product is marketed as helping people minimize the appearance of scars and stretch marks as well as evening skin tone and hydrating skin. Although it is uncertain that bio oil rosacea treatment would be as effective as using Revitol Rosacea Cream, it may help fade scars left behind by rosacea acne. Commonly used in Australian aboriginal traditional medicine to treat fevers and other minor ailments, emu oil is extracted from the fat of the emu bird. Studies looking into the effectiveness of this oil found that it has anti-inflammatory properties that promote wound healing. It is also a good source of linoleic and linolenic acids, omega-6 and omega-3 fatty acids respectively. Emu oil rosacea treatment can reduce swelling and redness if the oil is applied topically. The quality of the emu oil varies depending on the bird’s diet, so it’s important to purchase the oil from reputable sources. Almonds are mostly known for being tasty nuts that are great on salads. However, they are also a rich source of oil. Almonds contain oleic and linoleic acids, omega-9 and omega-6 essential fatty acids respectively. The oil extracted from the nuts make an excellent emollient that helps seal in moisture and ward of the skin dryness that can aggravate rosacea symptoms. Chamomile is a daisy-like flower plant that is well known for producing a tea that calms the nerves and alleviates sleeplessness. Like almonds, the oil extracted from chamomile plants are typically used in cosmetics as an emollient. It has anti-inflammatory properties that can soothe irritated skin and reduce redness. It is important to note that chamomile can induce uterine contractions. Therefore, pregnant women should avoid consuming or using chamomile. This essential oil is considered a powerhouse in the world of homeopathic remedies. Extracted from the melaleuca plant, tea tree oil has been used for centuries to treat a wide variety of illnesses as well as to flavour food. Tea tree oil has antiviral, antifungal, antibacterial, and antiseptic properties that work together to alleviate and cure various skin conditions including rosacea. The oil can either be applied directly to the skin or mixed with other oils to create a custom formula that meets your specific needs. Similar to chamomile, lavender is well known for having a calming effect on the people who smell it. Lavender oil, in fact, is used in aromatherapy and massage to help people relax. The oil has antiseptic and pain relieving properties and has been used to treat minor burns, stings, and bites. Use of lavender oil can alleviate the itching, burning, or pain associated with a rosacea outbreak. Pressed oil extracted from rose bush seeds, rosehip seed oil contains retinol (vitamin A), vitamin C, and is high in essential fatty acids. This oil has been used to treat a variety of skin conditions including dermatitis, acne, and eczema. Applied topically to a rosacea outbreak, this oil can help heal the broken capillaries and reduce redness. A lot of sufferers will use jojoba oil as a moisturizer. Most germs cannot thrive on skin treated with jojoba, so it can be helpful with acne and bumps associated with rosacea. Unfortunately, it’s only helpful in mild situations. Another way to control your bumps and pimples is using coconut oil. In fact, reviews have suggested there are additional benefits in the first two weeks (some rosacea improvement), but by the fourth week the flushing becomes persistent. You should also be aware of mites feeding on coconut oil, because they can grow in population. In the end, coconut oil is great for acne-like breakouts, but not for any other symptom associated with rosacea. Considered a natural antibiotic, wild oregano oil is sometimes used to treat rosacea bumps and pimples. However, it is not used as a moisturizer or face wash, but as a supplement taken with various foods. Since wild oregano oil is considered an antibiotic, you cannot take it for extended periods of time. Eventually, it will start killing the good bacteria in your body and make things worse. In fact, some sufferers believe your rosacea becomes worse after taking this as a supplement. Rosacea is a chronic disorder affecting the face, which includes the scalp. Doctors do not know what rosacea is caused by, even though many believe it is a cluster of diseases lumped together. Meanwhile, sufferers are left looking for ways to keep the symptoms under control. Everything from prescription medications to home remedies is used and they can manage your rosacea, but you should also consider adding a nutritional diet to your daily routine. Vitamins and Minerals – Consuming an ample amount of vitamins and minerals each day will help with acne and other rosacea symptoms. These natural ingredients can help you from the inside out. For instance, vitamin B can help maintain healthy hair, nails, and skin. In addition, vitamin C strengthens your immune system, as well as blood vessels. Any of these drinks or foods can cause acne or redness in the face. If mild conditions are left untreated they will become more severe and harder to overcome. This is why, it is important to treat your rosacea early. Herbal Treatments – There are several herbal treatments available to help your rosacea. For instance, flaxseed oil offers fatty acids. These help reduce your body’s inflammation, which can minimize the redness. Another herbal remedy is cat’s-claw extract. This natural ingredient helps with food sensitivities. If some of your triggers are related to food, cat’s claw extract can help re-establish a healthier intestinal area. Unfortunately, pregnant women should not use cat’s claw extract. These ingredients can be helpful for certain flare-ups and triggers, but they should not be considered cures for all the symptoms associated with rosacea. Effective DIY Recipes That Make At-Home Rosacea Care Super Simple! Around 15 million Americans suffer from Rosacea. And the irony is that a substantial chunk of them are not even aware that they have it. Most of them assume that it is only a dry-skin problem that will eventually go away…and this is where they make THE mistake! Rosacea is a serious skin problem and requires regular treatment and surveillance. And talking about regularity, wouldn’t it be better if you could take care of your Rosacea problems at home without using expensive ointments or taking antibiotics? To give you further insight into the matter, here are some Rosacea DIY ‘cares’ for you. Stir the emulsifying wax, the glycerine and the oil together in a double boiler. Make sure that the heat is low and wait until the wax melts completely. Remove the mixture from the heat source before adding the Vitamin E oil. In a separate pot, gently warm the hydrosol until it is lukewarm. This step is important because if the hydrosol is too cold, it will not mix well. Now, slowly add the hydrosol into the oil mixture simultaneously whisking the mixture until it is thick and smooth. Now, gently add in the essential oils and the grapefruit seed extract. You moisturizer is ready. Now, keep it in a clean and sterilized plastic bottle. Let it cool down and put the lid on. Store it in a cool and dark place and stir occasionally. Before everything else, fill a pot with hot water and place the green tea bag and let it sit to brew for a few minutes. Grab another pot and mix the remaining ingredients in it. Make sure that the green tea brew has cooled down before you use it. Take 5 tsp of the brew and mix it vigorously with the previously made mixture. The final mixture will appear milky white in colour. You can then apply it on your face. Focus more on the Rosacea affected areas. Leave it for 15 minutes and then wash it off with lukewarm water. Various ways to let go of all the problems that you are going through in your life may be very possible, nowadays, because there are some products which can easily help us overcome all our problems, may it be about having some discomforts or irritations in our face. If you are one of those people who is already sick of feeling belittled by others due to the fact that you have some acne, big pimples, red flares or blemishes in your face, then you can easily overcome that problem nowadays because there is an absolutely great help that you can have to attain the beautiful, smooth and glowing face that you want to have right now. This is your chance to really show the whole world that you are capable of being who you are without making any added effort but by just putting in pure trust on this item that has the full capability of making you look good once again. It is really hard to trust on any products that are introduced in the market today because not all of them really work the way we want them to be so but you can exclude this very great rosacea treatment that you can have very easily. It consists of all good nutrients and components to fight off all the hindrances that will make you a little bit less confident of bringing yourself in the crowd. The moment for you to really do achieve much greater things will be so possible when you would just put in the dependence on this truly amazing item that will be yours now. Check the background. If you would like to use this item, there is nothing that you would see that will affect you because this was made from top of the line laboratory that makes certain that there would be nothing that will put us down nowadays. There would be no revitol rosacea cream scam in here unlike those other items that you can find elsewhere that have all the negativities that we are most of the time afraid to get. Consult the doctor. To avoid the revitol rosacea cream side effects, you must visit your doctor regarding this problem because they can surely help you be able to overcome all the problems that you have with having some blemishes on your face. Be really enthralled by the good feel that you would have within you now. New happy living will be with you now if you would just trust on this very helpful item that you can have now. Clarify the benefits. If you want to learn more on how revitol rosacea cream will work well for your part, then you must take the help available for you to have nowadays. This is the chance that you will be able to live a life that is always full of happiness and content that you have hoped for all your life. Many people struggle with rosacea and until recently, you could not find anything for this skin condition over the counter. However, with new products on the market like Revitol Rosacea cream available, you can now treat rosacea at home. Rosacea (also known as acne rosacea) is a chronic acne-like skin condition usually found in adults ranging from 30 to 50 years old. However, anyone can be affected by it. Signs and symptoms include, but are not limited to, redness in the middle of the face, pustules, papules, swollen skin, visible small dilated blood vessels, acne-like breakouts, uneven surface of the skin, thickening skin on the nose, cysts on the eyelids, and itchy and dry eyes. What causes rosacea remains unknown? However, it is believed that any triggers resulting in blushing and flushing of the face can immensely trigger rosacea. For instance, since environmental factors like sunburn may cause flushing, they can be considered as triggers. Emotional factors such as agitation, embarrassment and stress can also play a big part in the development of the skin ailment since they may cause blushing. Intake of spicy food and alcoholic beverages may also cause flushing of the skin, and thus may trigger the growth of rosacea. Many people like the option to treat rosacea at home, and until recently there were no over the counter rosacea products available. Why resort to expensive cosmetic treatments such as laser therapy when you can treat it at home? Revitol Rosacea Cream was designed to treat the multiple symptoms of rosacea. From the embarrassing redness and varicose veins as well as the pimples, the all natural ingredients in Revitol will allow you to get your rosacea symptoms under control once and for all. Natural Bacterial Agents – These agents kill the surface bacteria naturally to aid in preventing further breakouts. Anti-Inflammatory – Helps by reducing the flushing and redness by constricting blood vessels near the skin’s surface. Oil Regulation – By regulating the natural oils in your skin this will help to build up a defence naturally against environmental issues that contribute to rosacea. Collagen Booster – Allows your skin to become more resilient to help effectively fight off rosacea and allow your skin to heal. Many people suffer from the effects of rosacea, in fact, as many as 80% have said that it has affected their self confidence. Having an effective over the counter treatment as part of your every day routine can help you control your rosasea once and for all. Rosacea is an inflammatory chronic disease. Sometimes, people are not aware that they are suffering from this skin disorder. Rhinophyma is a condition that may result during the early stages of rosacea, wherein, the nose is enlarged. Besides being swollen, the colour of the nose becomes red and there are times that thick bumps appear on the bottom part of it. Rhinophyma can also lead to puffiness of the cheeks and bumps may appear. Rosacea is said to be more common on women than men whose age is from 30-50 and affects usually fair-skinned people most of the time. When rosacea affects the nose, you can see small blood vessels that dilate and it worsen the appearance as the nose becomes red and bumpy. People suffering from this condition don’t mind the symptoms during the early stages as they are not aware of the disease called rosaces. What they think is that the blushing just occurs. Rosacea, often accompanied with a look alike of pimples, too. Due to lack of awareness, the condition worsens until it spreads to other parts of the face affecting the eyes too. It is advisable therefore to consult your physician or a dermatologist at times that you notice changes on your skin. There are several treatments for rosacea symptoms; but rosacea itself is not curable. It is more advisable to treat rosacea at its early stages. The doctors prescribe an oral antibiotic like tetracycline and a topical antibiotic. Steroid is prescribed by doctors also to lessen the inflammation. However, during the advanced condition of this skin disease wherein one suffers from rhinophyma already, surgery is best recommended for the treatment. The surgeon in here, remove the excess tissue on the nose with the use of scalpel, laser or electrosurgery. After the surgery, you can undergo dermabrasion to improve the appearance of the nose. Several factors can affect rosacea’s severity. Some over-the-counter medications that are used to treat acne can worsen rosaces. Therefore, consult your doctor about controlling such treatment. A person with rosacea must avoid anything that can lead to flushing as it makes the redness even worse. Some of these are spicy foods, smoking and alcohol. You must avoid too much sun exposure as well as extreme temperatures too. Be aware that sunscreens, moisturizers, soaps and hair sprays affect rosacea also but it is necessary to apply sunscreen to protect your skin when going out under the sun. Remember to apply anything on your face gently as too much rubbing can cause your face to become redder. Telangiectasias are a procedure that can be used to treat blood vessels that dilate. Your dermatologist uses a small electric needle, laser, pulse light or minor surgery. However this procedure requires a few treatments for better results. Your doctor can advice you the best option. Covering the dilated blood vessels with green-based moisturizers or a tinted foundation can work as an alternative. What is Rosacea? Rosacea, a facial skin condition affecting more than 16 million Americans, is little understood. Rosacea can manifest as flushing across the cheeks, nose, chin and forehead. The redness can also appear in conjunction with dilated, visible capillaries or rash-like patches. In most extreme cases, eyes can become chronically irritated and watery. Affected flushed skin can feel sensitive, dry or sunburned-resulting in a burning or stinging sensation. Though it’s not harmful to one’s health, rosacea affects the face. And as many might know first-hand, facial problems can be a cause for emotional stress and anxiety. For this reason, National Rosacea Society aims to educate the public about rosacea-emphasizing the importance of professional diagnosis and treatment. National Rosacea Society reports that 76% of patients say that rosacea negatively affects their confidence and self-esteem, 41% have even confessed to missing work and social engagement because of their appearance. These numbers demonstrate just how important it is to get rosacea under control before it runs rampant and becomes more than just cosmetically damaging. Are you a rosacea patient suffering from the redness, bumps, and sensitized skin? Have you tried avoiding foods, creams, and skin treatments to prevent future flare-ups? Here are some common triggers that rile up redness. Approximately 72% of rosacea patients say that red wine is the biggest alcoholic trigger. 31% say that just one drink causes a flare-up, the same percentage say that only half a drink will cause a flare-up, and 15% experience a flare-up after only a sip or two. To find out what other alcoholic beverages trigger a rosacea flare-up, check out the review on National Rosacea Society. Other common triggers are environmental extremes. The biting cold or a sharp breeze can trigger flare-ups. To ward off dry, sensitive skin, sun block and moisturizers are recommended. Some rosacea patients find that a rise in body temperature causes a flare-up. Common problem-makers are extreme indoor heating, hot steamy baths, and saunas. Spicy foods are common trigger for many. But for those who love their flavours and can’t imagine a life without spice, check out some savoury alternatives. While the cause of rosacea is largely unknown, there’s evidence showing that rosacea can be calmed with laser treatment. Two common laser treatments used by rosacea patients are Intense Pulsed Light (IPL) and Laser Facials. IPL applies broad-spectrum light to your skin, while Laser Facials heats your dermis which sits directly below your epidermis, or your outermost skin layer. Both treatments can reduce blotchy skin by diminishing redness and reducing the visibility of prominent capillaries. How do they work? Both treatments penetrate the skin, heating up the capillaries and causing them to collapse. They are naturally broken down and reabsorbed by the body. Besides special treatments, rosacea patients maintain redness through their daily beauty routine. Various creams and beauty products can irritate rosacea. Many eliminate those outbreak-prompting products from their routine in favour of products specifically designed for sensitive skin or produced with calming ingredients. Constant redness of the cheeks, nose, chin and forehead and facial breakouts are the major symptoms of rosacea which are initially seen. During the later stages of rosacea, the skin of the face is thickened and the nose become enlarges and it will also affect the eyes and the vision. As mentioned by the National Rosacea Society, the redness in the face caused by rosacea is known as erythematotelangiectatic rosacea and it may occur to women who are above 30 years old. Usually, the first signs that you may notice is constant flushing and the tendency to flush easily. The redness may come and go but later on the face will have permanently red colour. In some instances, the small blood vessels under the cheeks, nose and chin skin become noticeable. During the progression of this skin condition, the individual may develop blemishes and swelling on the affected areas. This is known as papulopustural rosacea which can result into bumps and pimples on the face together with redness in the area. Once the pimples are filled with pus, they are called pustules or papules. Since these pimples look like acne, they call rosacea as “adult acne.” However, the American Academy of Dermatology noted that rosacea unlike acne does not cause blackheads. At times rosacea may appear once in a while accompanied with occasional flare-ups. Women are the one usually affected with this type of skin disease especially near their menopausal stage. Rosacea is chronic which means that it is a long term type of disease and at the same time progressive. It allows patients to experience more severe symptoms over time. The advice is to visit your doctor at the first sign of rosacea to manage the symptoms and to prevent the disease from getting worst. The fact is there is no treatment for rosacea however as Mayo Clinic says there are many ways to prevent flare-up of rosacea. You must protect your skin from sun exposure with the help of a broad-spectrum sunscreen to avoid triggering rosacea symptoms. Another way is by protecting your face from environmental factors like the wind and cold weather and from getting overheated. It is also a must to avoid spicy foods, alcohol and hot drinks as these can trigger flushing too. Try to use skin products that are gentle to the skin and that are free from harmful ingredients like alcohol. Avoid using make up products that contain oil as well. If a person having rosacea is experiencing facial redness, the doctor recommends treatment with sunscreen and a barrier-repair emollient lotion to calm the skin. Oral antibiotic can also help with redness and topical medications containing ingredients such as metronidazole, azelaic acid, sodium sulfacetamide and retinoid may help reduce inflammation though it takes some months to see visible effects. Severe redness and visible blood vessels may require laser or some kind of light therapy. Rosacea blemishes can be treated with both oral and topical antibiotics.